After the rain and thunder storms earlier this week, summer has returned to this part of Ireland. Two friends have come to stay in the Rectory in Askeaton for the weekend, and at first it seemed that both the rain and the Foynes Air Show were going to immobilise us and stop any efforts to show off this part pf west Limerick and north Kerry. But the sun came out early this afternoon [22 July 2017], and after a rehearsal in Saint Mary’s Church, Askeaton, for a Baptism tomorrow, four of us decided to have another look at the former Franciscan Friary in Askeaton. The cloisters in this friary, known locally as the Franciscan Abbey, never lose their ‘wow factor’ for me, and deserve to be restored. They have the same appeal as the cloisters in Saint John Lateran in Rome or Belem in Lisbon. The traffic was heavy on the road to Foynes, but we decided to follow the diversions through Shanagolden, and few delays we arrived in Tarbert, Co Kerry, and caught the ferry across the Shannon Estuary to Killimer, Co Clare. From there, it was a short drive in the afternoon sun through Kilrush and along the Wild Atlantic Way to Kilkee. After lunch in the Diamond Rocks Café at the west end of Kilkee, we set off along the cliff walk, a three-mile loop that begins outside the cafe’s door around the cliffs and with spectacular sea views and scenery. Later, we caught the tourist fun train outside the café and were brought on a tour through the town and along the horseshoe-shaped beach to the east end of the bay. At the height of summer, Kilkee is a happy, joyful, family resort. The blue skies and the clue seas, with the sun sparking on the surface of the water brought me back to Greece last week. It was late in the evening when we caught the ferry back from Killimer to Tarbert, and darkness was beginning to close in as the four of us sat down to dinner in the Rectory in Askeaton. On the way back down the mountains from the Monastery of Arkadi to the coast of Rethymnon in Crete last week, I stopped briefly to see the small church in Nea Magnesia that is dedicated to Aghia Magdalini or Saint Mary Magdalene. This is one of only two churches dedicated to Saint Mary Magdalene on the island of Crete. Nea Magnesia is 12 km east of Rethymnon, near Skaleta and off the road to Panormos. Today it is fast becoming part of the resort facilities building up east of Rethymnon. But in the 1920s, this village was first settled by Greek-speaking people who had been expelled from their homes in western Anatolia. They arrived in Crete with their Greek language, traditions and culture and dedicated their church to Saint Mary Magdalene, whose feast in the Church calendar, east and west, falls today [22 July]. The other church in Crete dedicated to Saint Mary Magdalene is an impressive Russian-style church on Dagli Street in Chania, with an onion dome and surrounded by a beautiful garden in the district of Chalepa. The church was built in 1901-1903 by Prince George, the High Commissioner of Crete. 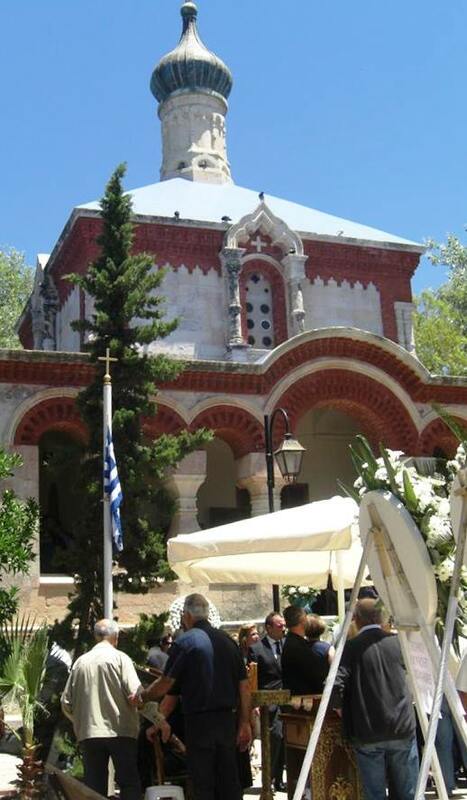 The church was funded by the Czarist Russia and was opened in 1903 in the presence of Queen Olga, Prince George, Bishop Evgenios of Crete and a small number of invited guests. I regularly pass Chalepa on my way to the and from the airport. With its imposing mansions and luxury villas, Chalepa is a beautiful part of Chania, east of the city on the coastal road to the airport and Akrotiri. Chalepa was the venue for some of the most important political events in Crete in the 19th century. Here Prince George had his palace as the High Commissioner or governor of the semi-autonomous Cretan state in the closing days of Ottoman rule, and here too the Great Powers had their consulates. But Chalepa was also the home of Eleftherios Venizelos, who played a decisive role as Prime Minister of Greece during a critical time in Greek history in the early 20th century. The family house was built by his father, Kyriakos Venizelos, in 1877. Today, the family home houses the Eleftherios K Venizelos National Research and Study Foundation, which plans to turn the house into a museum. According to Greek tradition, Saint Mary Magdalene evangelised the island of Zakynthos in 34 AD on her way to Rome with Saint Mary of Cleopas. The village of Maries on the island is said to be named after both Saint Mary Magdalene and Saint Mary of Cleopas. A relic of her left hand is said to be preserved in the monastery of Simonopetra on Mount Athos, where she is revered as a co-founder of the monastery. During the Middle Ages, Saint Mary Magdalene was regarded in Western Christianity as a repentant prostitute or promiscuous woman, but these claims are not supported in any of the four Gospels. Instead, the Gospels tell us she travelled with Jesus as one of his followers, and that she was a witness to his Crucifixion and his Resurrection, Indeed, she is named at least 12 times in the four Gospels, more times more than most of the apostles. Two Gospels specifically name her as the first person to see Christ after the Resurrection (see Mark 16:9 and John 20). 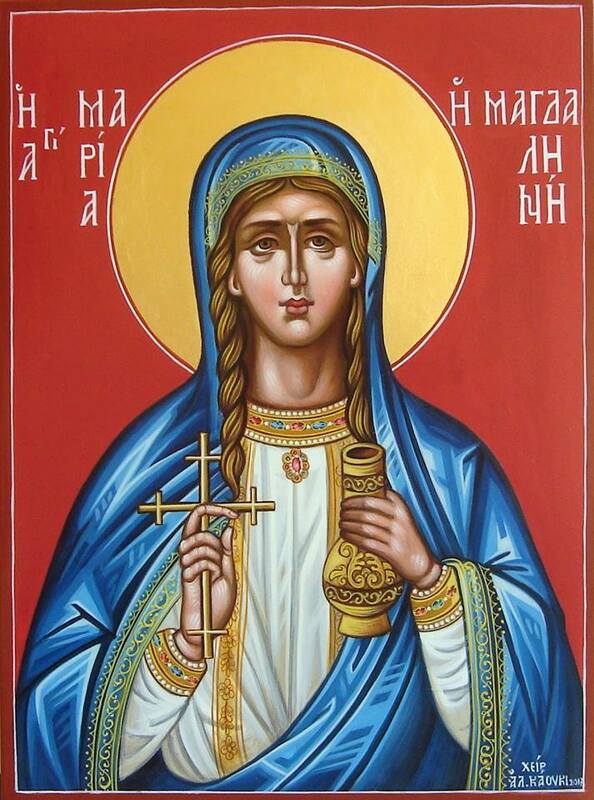 Last year [10 June 2016], Pope Francis recognised Saint Mary Magdalene and her role as the first to witness Christ’s resurrection and as a ‘true and authentic evangeliser’ when he raised her commemoration today [22 July] from a memorial to a feast in the church’s liturgical calendar. The Vatican’s Congregation for Divine Worship issued a decree formalising the decision, and both the decree and the article were titled Apostolorum Apostola (‘Apostle of the Apostles’). An icon of Saint Mary Magdalene at the Resurrection, Μη μου άπτου (Noli me Tangere) by Mikhail Damaskinos, is one of the important exhibits at the Museum of Christian Art in the former church of Saint Catherine of Sinai in Iraklion. This icon dates from ca 1585-1591. Initially it was in the Monastery of Vrondissi and was transferred to old church of Saint Menas in Iraklion in 1800. But perhaps the most inspirational icon of Saint Mary Magdalene I saw in Crete this month is a new icon by Alexandra Kaouki in her workshop near the Fortezza in Rethymnon. Readings (The Book of Common Prayer, the Church of Ireland, and Common Worship, the Church of England): Song of Solomon 3: 1-4; Psalm 42: 1-10; II Corinthians 5: 14-17; John 20: 1-2, 11-18.